Hi Teebz, Jet here from UW. As you may know, the Seals were my favorite team, from 3,000 miles away. It should be noted that the Seals had 4 different variations of colored skates - the first year under Finley they had yellow (gold) skates with green trim and the less-often seen green skates with gold trim. 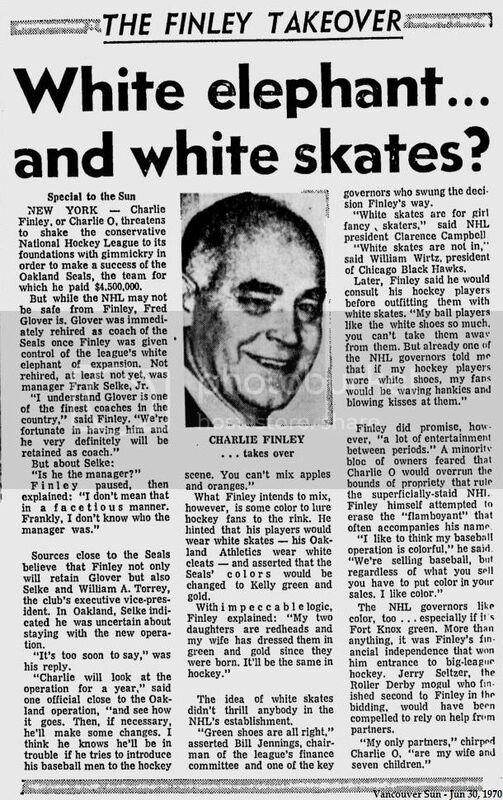 A year or two later they changed to white skates with green trim, then finally all-white skates with only green shoelaces. Finally, when the team was sold back to the league in late 73-74, they ditched the colored skates and wore traditional black/brown boots for the first time in the green/gold era. I saw one of those games on TV in NY, Rangers at Oakland. I know about the other colors. In fact, the green and gold skates were even worse than the white skates because they were, in fact, painted. The problem was cost, though, as the skates that Finley chose for his colorful exercise were made in Japan! I'm doing more research on skate colors (for example, St. Louis used blue and yellow) for a future article. I'll let you know what it comes out! Hi, I'm a former ITV producer who put together that piece on the Seals. I grew up in the Bay Area and went to many games at the Oakland Coliseum throughout the Seals existence. I moved back to Canada after film school and started my TV career in Edmonton. I thought a history piece on the Seals might be interesting and managed to track down a lot of footage from various sources, including a Bay Area TV station, and another station in Boston that televised the Bruins games. I called former Seals coach Vic Stasiuk who sent me a 16mm print of a documentary that someone had made about the team. I also got help from a variety of former Seals front office staff who sent me a variety of great photos. This was a labor of love and I'm glad it brought back some nice memories. I posted a better quality version of this story on You Tube, along with a piece I did a few years later when the Seals booster club came up to Edmonton. I later moved back to California and had the pleasure of producing a number of stories on the return of hockey to northern California when the San Jose Sharks came into existence. I have a replica Seals jersey that I proudly wear whenever I go to a Kings game here in LA where I now live.